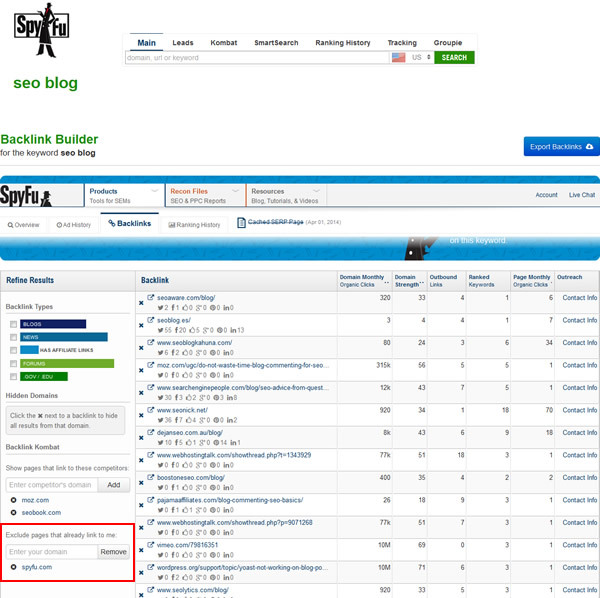 The tool is “Backlink Builder” by SpyFu. This tool just became available in open beta, and it will be opening up to everyone in a couple of weeks. Now, with all the great tools already out there to help people find solid links you may be asking, “Why do I need yet another?” Great question. Most of the tools we use right now are based on finding trends in backlinks or assigning metrics to them. Moz gives their score to link x, Majestic or ahrefs assign a different value but then show you which competitors they link to, etc. All useful functions. Using current tools we get to understand how sites interlink on the Web and, with some understanding, what domains are likely hubs or are passing weight. To understand what SpyFu does a bit differently it’s important to understand what they are as a global toolset. As their core, SpyFu collects and stores ranking data for phrases. Lots and lots of phrases. Historically I’ve used them for competitor analysis to understand which phrases a company might rank for or be bidding on via PPC. Enter a URL and you’ll get a decent snapshot of what that person is bidding on and what they rank for organically and how they’ve ranked over the past seven years. A service that knows which sites have ranked in which positions over the past seven years…and you’re looking for relevant, long-lasting links. I’m going to pause right now and let that sink in for a second. OK…so now that that has sunk in, let’s give you a sneak peek of how it can be used to find great resources. 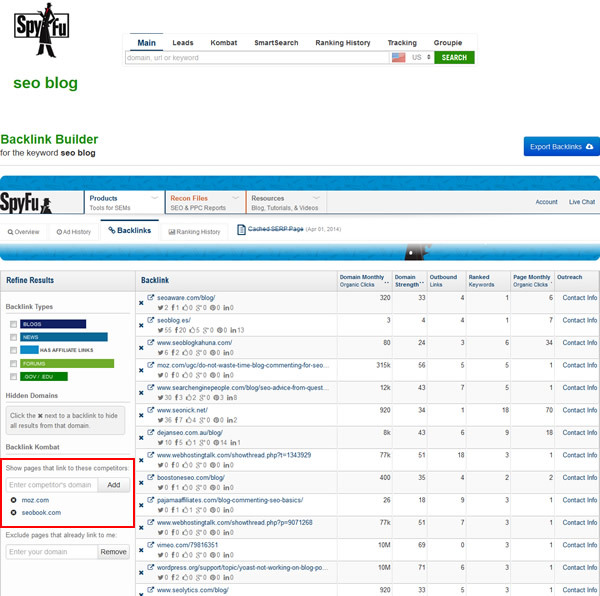 To keep things smooth…let’s even use the same phrases I used in my last article and find links that would be suitable to help rank for “seo blog.” This time though we’ll look for links we’d pursue to rank SpyFu’s blog. They all offer something of value but obviously the tab we’re interested in right now is the Backlinks tab. 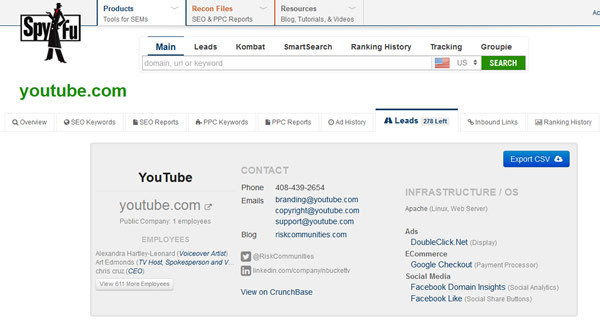 Click on it and you’ll be presented with a list of URLs that link to the top ranking sites. Obviously you can look through the generic results to find opportunities, but I far prefer filtering data as much as I can to reduce false-positives. Let’s face facts: in the time you save you’ll be able to find more than you miss. But that’s preference not requirement so if you prefer global data, stop here and start your hunt. If you’re like me, simply enter a few of the domains in the Backlink Kombat box (in red in the image above though not on the site) and the list will reduce to just the sites that link to the domains specified. And of course the next step is to remove the pages that already link to you. Occasionally you may want to go after them but generally when I’m link building I’m seeking new opportunities. This will reduce the list down to pages that rank for phrase-matched versions of your keywords and where the domains link to the sites you listed as competitors. Domain monthly organic clicks – the estimated number of organic clicks the domain gets per month. Domain strength – SpyFu’s estimate of the strength of the domain. Outbound links – the number of outbound links on the page. Ranked keywords – the number of relevant phrases that page ranks for. Page monthly organic clicks – the estimated number of organic clicks the page gets. So what you’ll have is a list of pages that rank for a phrase of your selection (“seo blog” in this case) and which links to your selected competitors and not to you. Essentially we have a list of keyword-relevant sites that link to sites just link yours. This doesn’t mean the link building is easy. It’s now time to visit these sites, figure out how your competitors got their links, and see if you can do the same. It’s important to remember that the goal of using this tool isn’t to “get a win on every page.” It’s to short-list sites that are worth looking at. And that’s what this tool does. It’s probably pretty obvious that I like what I see from this tool but it doesn’t replace the ones I use already. 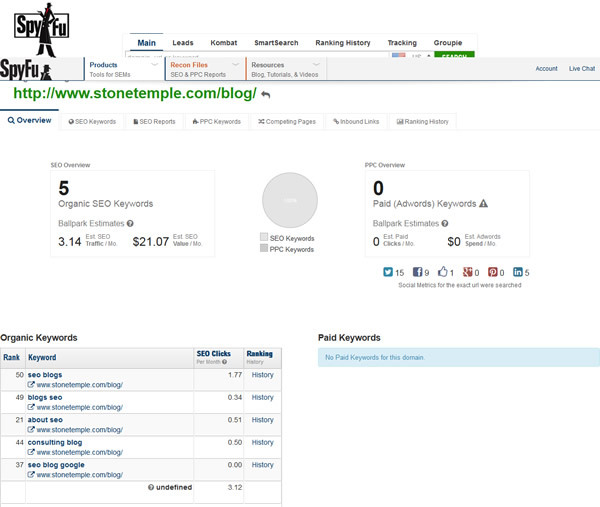 It has some limitations, including backlink database size and the tool itself is just coming out of beta.